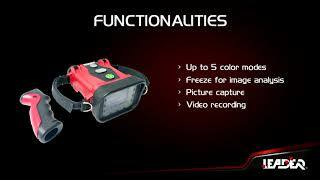 The mains charger charges the following Leader thermal imaging cameras: TIC 3.1, TIC 3.3, TIC 4.1 and TIC 4.3. 2 batteries can be recharged simultaneously directly in the camera. Once the charge is complete the camera is ready to go on the field. LiFePO4 batteries are charged as follows: 100% in 2h, 90% in 1h30 and 80% in 1h20. LEDs visually inform on the state of full charge or not. Orange: charging, Green: battery charged. Mains charger allows LEADER batteries to be recharged directly in Leader TIC 3 and Leader TIC 4 thermal imaging cameras. Simple to connect, it quickly charges the batteries (100% in 2 hours). Green LEDs are activated once the charge is complete. Discover the Thermal Imaging Cameras LEADER TIC 3 & 4 and their strengths ! Fire attack camera with 3.5'' screen and 1 button for ease of use during fire operations. Fire attack camera with 4'' wide screen and 1 button for ease of use.